I have more pink to show you! The pink blanket is finished. Lately I've been a one project kind of girl. Usually I have two knitting projects to work on. One for home and one to take along. The blanket fulfilled both categories, which means it's an easy pattern. I'm very please with how it turned out, but I must say the photo's color is not so great. Very washed out. The close up of the pattern is more true to life. Another easy pattern is this Popsicle scarf that I've been working on. It's my second one. I made a rust one Christmas 2010 for my daughter-in-law. 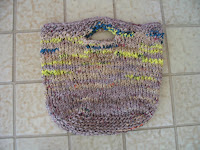 This time I chose a pink yarn that is suitable for spring and maybe even summer. More pink with threads of many colors. I'm not sure I like this pattern for this (Red Heart Hula) yarn, but I'm continuing on and will see how it looks once finished. I'm not sure if it will block as it is an all acrylic yam , but feels more silky like a microfiber. I really doubt it will block, but we'll see. I'm in love...with my new orchid. Here's a photo when the second bud opened. It brings me such joy when each and every bud opens. Love, love, love it! Here's a photo of bud number three opening. Don't you just love it? Stlll have a bunch more buds to watch and savor. Look what I found. I just had to show you. My spool knitter. An ancient, vintage, German, special spool knitter from my childhood.Can you imagine I still have the original box and instructions in Deutsch of course? What I love about this particular one is that the pegs or nails are bent so as to not catch the yarn as you pull the yarn loops over themselves. Pretty cool. 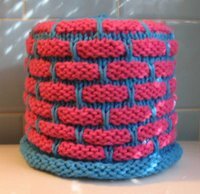 I have several spool knitters, but I have to admit this is the most unusual one. Well, I guess that's about it for now. It's been a busy day today with being up at 5 am and some traveling, listening (to my book and jazz band music) and knitting, so now it's time to wind down and rest up. Daylight savings time starts tomorrow and I do so hate to lose that precious hour of time. Your blanket turned out lovely. I think I will give this a try someday. It just won't be for the new babe due in April. I'm sure he will receive plenty of quilts from his grandmom. 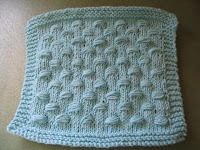 Love the baby blanket, saved the pattern, might have to give that one a go. I like the peachy color in the 2nd and 3rd pictures. Acrylics block, I block all the ghans and they always acrylic. I wash them in cold...lay them out tug here and there to make them even etc. Works pretty well. They usually don't require pins.........once in awhile they do; and about a day and half to dry. Each time I pass by I look to see if I need to tug anywhere again...sometimes I do. What a cool find, your German spool from your childhood - that is awesome! The baby blanket is beautiful. It felt really good to get rid of a bunch of stuff before and after our move. This post is packed with beauty from the blanket to the orchid. I love it all. Lovely little spool! It's so cute! The pink blanket really came out beautiful. 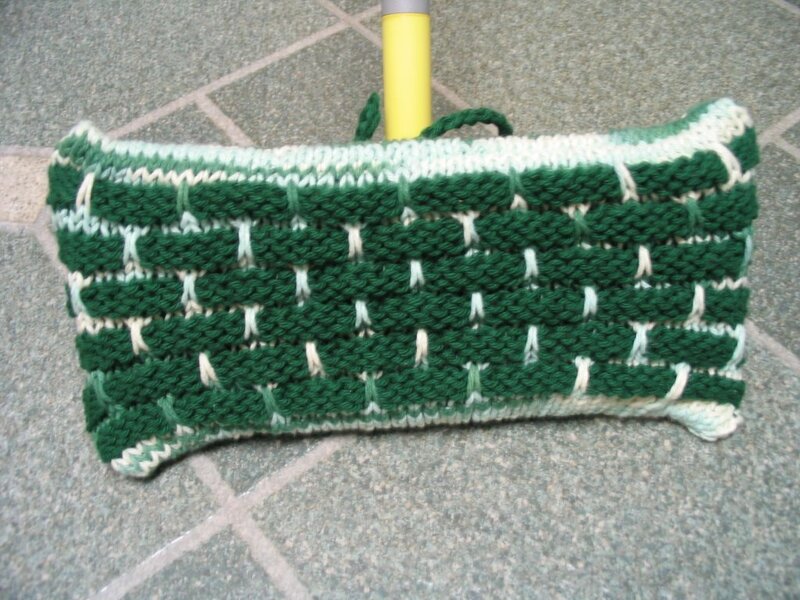 I don't recognize the stitch, though...so I'm off to Rav to try to locate the pattern. Your orchid is just beautiful! I love the pictures with the light in the background - really shows her off well. The blanket is very pretty! You've been a bus y girl! What a neat spool knitter. It's wonderful that you've had it so long. Spring has sprung in the foothills! Have a great week! Thanks for this pattern! I'm working on it for my niece who's due in Sept. What weight is your yarn? Mine is DK, so I think it'll be a little smaller than yours is. Nice orchid! Wish mine would bloom. Love your little spool knitter. Remember when spools were wooden and you could make your own with 4 nails? the pink blanket is pretty! i have become a one project at a time knitter too. it's probably better that way. though from time to time i will cast on for a few at a time but finish them one by one.